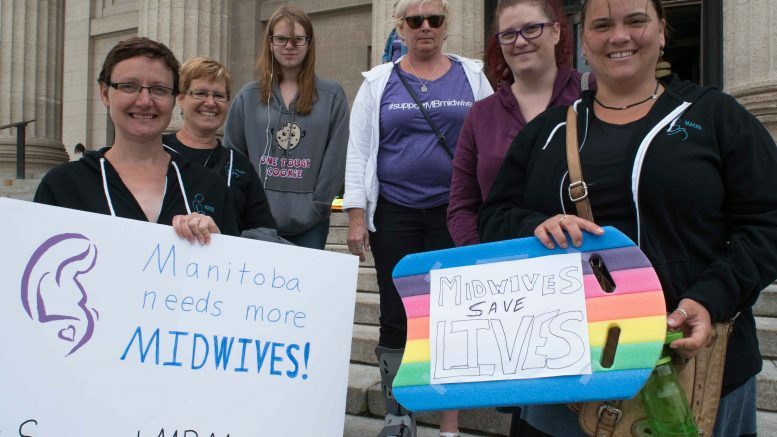 Students and supporters rallied at the Manitoba legislature June 30 in support of the province’s only bachelor of midwifery program, which students learned last week will not offer courses in the fall. The program, offered jointly by the University of Manitoba and the University College of the North (UCN), had been on track to enter its second year with a cohort of 14 students. The joint program superseded a previous UCN-only program that operated from 2006 to 2014 and graduated only nine students during that time. In the run up to April’s election, Manitoba’s previous NDP government promised a funding increase of $844,000 to support the more expensive joint program, which would need full-time instructional staff, the capacity for an annual intake of students, and new academic supports for students. However, the new Progressive Conservative government’s first budget, released in May, did not include a funding increase for the midwifery program. Funding was maintained at the previous level of $859,000, effectively making delivery of the joint program impossible. Since only the joint program is approved by the College of Midwives of Manitoba (CMM), while the standalone UCN program no longer has approval, the program as approved by CMM cannot proceed. “This work is continuing,” he wrote. A representative from education minister Ian Wishart’s office could not be reached by press time. Wishart said in question period June 13 that “there will be a program in place” for current midwifery students in the fall, and a June 28 government press release said the province is working toward a “new educational pathway” for midwifery students. “We remain committed to the students who have completed the first year of UCN’s bachelor of midwifery program,” Wishart said in the release. Midwifery students were subsequently offered places in the U of M’s nursing program for the fall. According to NDP education critic Wab Kinew, remote communities in the north have a particular need for midwives. “When you talk to people in northern Manitoba, one of the top overall health priorities that they have consistently identified is returning birthing to their communities,” Kinew said in an interview. In a committee meeting on June 23, Wishart suggested northern Manitoba may need nurses with midwifery training rather than ordinary midwives. “Perhaps what we really need in those [northern] communities are nurses that are trained as – with an additional midwives course rather than midwives themselves,” he said. “Certainly, there’s a need in every community for nursing and in many of these communities it’s tough for them to find nurses and many of them are there under contract and in and out in the communities. However, Jill Larner, one of the program’s stranded students, was not expecting the program would be cancelled abruptly. “Our acceptance letter told us that some of the policies and procedures were under review and if any changes were going to be made to this program, that there was a contingency plan in place and we would be seamlessly transitioned into it,” Larner said. Lauren Henderson, another student, pointed to the cost of pursuing midwifery training as a particularly strong pressure on students. Both Larner and Henderson said a spot in nursing at the U of M is not a substitute for midwifery training. Both students pointed to sacrifices they and their colleagues have made in order to enroll in the program. Larner said she sold her house to finance her education. When asked what their short-term future holds in the event that the midwifery program is not delivered in the fall, both Larner and Henderson said they didn’t know. Since its inception, the bachelor of midwifery program has been beset by troubles. Until 2013, no students had graduated from the program, in part due to the lack of available clinical spaces. Since 2013, only nine students have graduated. The province has spent just under $900,000 per graduate on the program since 2006. The program’s annual funding and spending has held relatively constant for years, even when no students were enrolled in the program. The small number of midwives in Manitoba – about 40 during the height of the standalone UCN midwifery program – complicates the clinical placement portion of midwifery education. Midwifery students need to be supervised by practising midwives during this phase of their training. In 2012, four students sued UCN for failing to provide sufficient instructors and clinical supervision for them to complete their degrees. The university settled confidentially.